Learn what you can expect from convocation by reliving past ceremonies. Convocation is the first of many traditions new students will experience at Rollins. Rollins formally welcomed the Class of 2019 and transfer students during convocation on Thursday, August 20. "As we celebrate 125 years of achievement, we recognize that the College we know today is the sum of innumerable individual contributions. We salute the trustees, faculty, staff, students, alumni, parents, neighbors, and friends who have transported us to this morning. 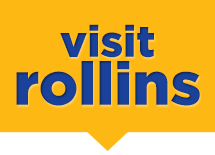 Generous and loyal benefactors have stepped forward throughout Rollins’ history—from providing for the College’s founding to rescuing it from financial peril, to assuring its health for future generations. Since 1885, the citizens of Winter Park have been our partners in creating and sustaining a dynamic synergy between our communities, and it is our pleasure to welcome you into our academic home." Relive the 2008 convocation ceremony. "Engage deeply and responsibly in the social life of our residential campus. Attend also to your physical education, and care for your health and well-being, as you also attend to your intellectual studies. And embrace this invitation to become an integral member of our community of learners. Live of this world, not merely in it. For ours is an education at Rollins of mind and body and heart. As you find your passions, throughout your time here with us, as throughout your life, engage them with courage and conviction."